If you've ever dealt with a clogged gutter, you know how much damage it can cause. From water in your basement to having to climb up on a ladder to clean them, gutter clogs can wreak havoc and be a hassle to deal with. Installing gutter guards is an easy way to put an end to your clogged gutters and constant gutter cleaning. But with so many options available, how can you choose the best gutter guards to protect your home? Find out what makes MasterShield stand out among other gutter protection systems on the market. Is it just a "leaf guard" or does it keep out other debris too? This list is by no means exhaustive. There's much more that we find clogging gutters and gutter guards, and MasterShield works on ALL of it - guaranteed. What about the wet debris that slides off my roof? You might be asking yourself, "what happens to the wet, sloppy stuff that slides off my roof?" For most gutter guards, this is not discussed or thought about. Usually what happens is either it doesn’t slide off at all because it just sits there on top forming a barrier and keeping water out of your gutters, or it ends up all over the face of the gutter where you can see it. 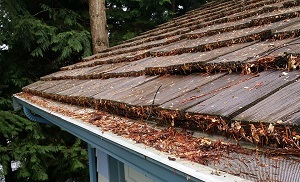 If the gutter guard isn't at a steep enough angle, then leaves, pine needles and other debris can collect on top of your roof and gutter, rather than sliding off to the ground. In other words, the gutter becomes a shelf where debris collects. 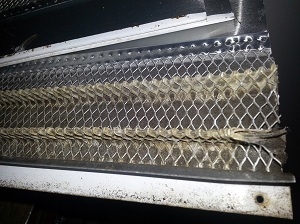 This is a common problem with many types of foam gutter guards as well as some screen and mesh gutter covers. If the debris doesn't fall off on its own, eventually you'll have to climb a ladder to clean your gutters. This certainly relates to the angle of the guard shedding debris, but there’s a lot more to it than that. No matter how well you shed debris, there’s always going to be some particle size that could get wedged into the product somehow. Think about it – you get an infinite amount of junk of any infinite variety of sizes – how do you deal with a particle like pollen that could get stuck in a pore? MasterShield system already working before installation is even complete in Beaverton, OR! Will the installation of a gutter guard cause damage to my home? There are questions you should ask about the installation process: How is this attached? How does it interact with the roof? Is there only one way to install this? What happens if the gutter is too high? Too low? At what angle is this guard designed to have water hit it? How much water does it handle? Is it rigid or flexible? So many people seem to take this for granted these days, but if the actual work isn’t done by the company you hired but is instead farmed out to a low bidder whose name you don’t know and isn’t even responsible for your job – how much is that guy going to care about your satisfaction? Most gutter guard products do a good job of keeping out large leaves, but many fail to stop dirt and pine needles from getting into the gutters. The purpose of gutter guards is to prevent clogged gutters and stop the need for frequent gutter cleaning. 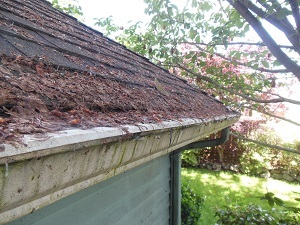 If your gutters fill up with dirt and pine needles, your gutters are likely to clog. Do I need to worry about galvanic corrosion of dissimilar metals? Galvanic corrosion occurs when two different metals are touching in the presence of an electrolyte, causing one of the metals (the anode) to corrode faster than it would alone, and the other metal (the cathode) to corrode much slower. There are at least 50 products on the market that suffer from this and they all fuse together after a short life. 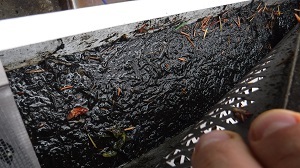 There are ways that gutter manufacturers can prevent this, such as avoiding contact between dissimilar metals or using non-metallic, non-conductive coatings. Most gutter guard companies will promise to clean your gutters when they clog. With our gutter guard warranty from MasterShield, we promise that if your MasterShield-protected gutters ever clog, the system will be replaced or you'll get your money back! You want a gutter guard that's going to keep your gutters free of clogs so you don't have to worry about cleaning them or worry about water damage. MasterShield is a micro-mesh gutter guard, made of high-quality aluminum and surgical-grade stainless steel. MasterShield’s multi-patented microfiltration technology and strong yet flexible construction is capable of blocking any debris larger than half the width of your hair. MasterShield gutter guards are installed at the same angle as your roofline, so debris won't get trapped. Leafless in Portland is the certified installer of MasterShield gutter guards in Portland, Vancouver, Gresham and all of Greater Portland. Call us at 1-844-385-7709 to request an on-site consultation and free estimate today!